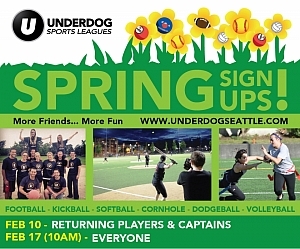 Underdog organizes its leagues around the four calendar seasons each year: Winter, Spring, Summer, and Fall. With staggered start dates during each, seasons overlap by a number of weeks across leagues. Registration for leagues open several weeks in advance of each season, as noted below. While Underdog registration is strictly first come, first serve (we do not hold spots for returning teams), teams that have played in a previous league can register one week "early" after logging into their Player's Page. To be reminded of registration dates and receive other information, click here and enter your email in the bottom left corner. To sign up for a league that is currently open, click here. Start dates are subject to change, and leagues may be added or changed.